Fish Oil & Oleic Acid Counter Each Other's Beneficial Health Effects: MUFAs Improve Cholesterol & Glucose Metabolism, Fish Oil Lowers Triglycerides But Only On Their Own! Oleic acid and fish oil don't mix. Everybody is still talking about the omega-3 to omega-6 ratio, but SuppVersity readers are, as always, one step ahead and will (as of now) closely eye-ball their omega-3 to MUFA or precisely their DHA + EPA vs. oleic acid ratio, as well. "Hold on!? 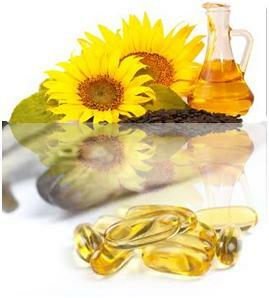 Healthy sunflower oil?" I know, the current dogma is: "There is no oil beside fish and coconut oil... well maybe virgin olive oil." But just as the term "dogma" implies this is just a deeply ingrained pattern - no universal truth. The statistically significant reductions of total and LDL cholesterol in the OSO group (8g/day; 6.5g oleic acid content), which was absent in the fish oil (2g/day) group would be one of those effects that contradict this dogma. And as it turns out - the effects probably will not even even manifest themselves in those of you who apply the "better I take any supplement on earth, to make sure I don't miss something", when you stand in front of the virtual or real shelves of supplement vendors. Allegedly, the fish oil (49.5 % PA, 19.6 % DHA), which was just as the the high oleic acid sunflower oil (81.6 % oleic acid) provided in capsules, had it's own advantages, but if you take a closer look, you will see the same hitherto not fully "paradigmatized" pattern arise: Take both and negate the effects of one. For omega-3 vs. omega-6 we already know that the conversion of the short chain omega-3 fatty acid ALA to its long-chain brethren EPA and DHA is hampered by high intakes of linoleic acid (LA: short chain omega-6), because they require the same enzymes needed for the generation of arachidonic acid (ARA) from LA. The "competition" the scientists suspect to be working here is instead probably on a cellular or receptor level. Well, I guess future studies are going to elucidate that in more detail... right? Supercharged Phenol-Enriched Virgin Olive Oil - would it be worth the extra-money (learn more)? So what can we learn from these results? "If you want everything, you rarely get anything..." well, I guess that is a bit platitudinous. Rather, the results from the study at hand complicate the already overtly complex interplay between different forms and quantities of fatty acids in our diet. The magic really is in the ratios and while I cannot tell you what the most beneficial ratios are, I can tell you that everybody telling you they know exactly how your and everyone else's optimal omega-3-to-6-to-9-ratio looks like is a quack - you can take my word on that. Hlais S, El-Bistami D, El Rahi B, Mattar MA, Obeid OA. Combined Fish Oil and High Oleic Sunflower Oil Supplements Neutralize their Individual Effects on the Lipid Profile of Healthy Men. Lipids. 2013 Jul 26.